There is simply no better time to plant trees than in the cool, crisp air of autumn. Whether dealing with fruit, nut, shade or ornamental trees, fall planting gives a tree’s root structure time to gently acclimate to the soil before going dormant for the winter. Amending the soil with compost or aged manure is a great way to provide nutrients to newly planted trees. Although trees can be planted nearly anytime the ground is not frozen, the high heat of summer and the wild swing of temperatures throughout spring can be stressful to a newly planted tree. However, in the cooler fall weather, without the scorching heat or constant freezing and thawing, roots have an easier time settling into the soil. As spring returns, they come out of their dormant state ready to grow and flourish. Here are a four big keys to successfully planting trees in your landscape this fall. One of the biggest mistakes made when planting trees is not digging the hole large enough. 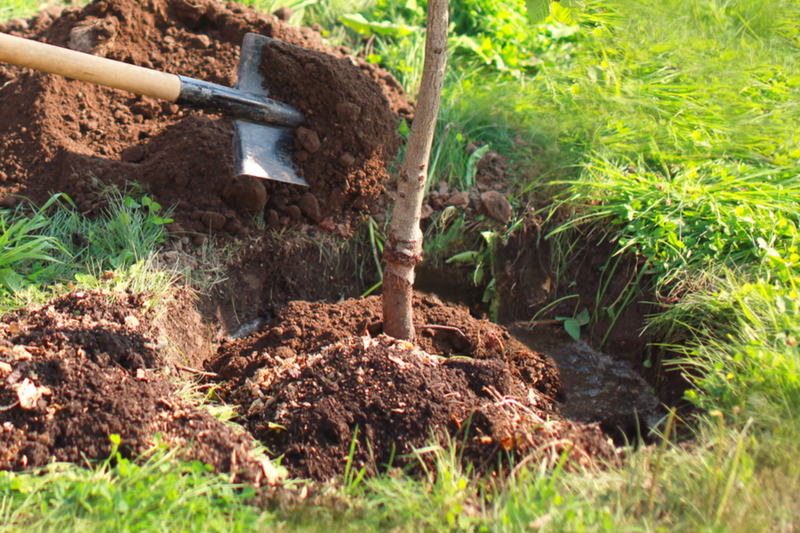 Digging to a larger size helps break up the soil, making it easier for trees to spread their roots. The loose soil is also important for forming air pockets and channels in the soil. These are vital to bring both air, water and nutrients to the root zone. Planting holes should be dug at two times the circumference, and 6 inches deeper than the root ball. This allows plenty of room for expansion of the roots. It is important to note that you will not be planting the tree down 4 to 6 inches into the soil. This depth is purely to help break up the hardened earth under the root ball for roots to expand. Once the hole is dug, its extremely important to amend the soil. Especially if the soil is clay or hardened earth. When it comes to trees, two of the best amendments to add are compost and aged manure. Compost has the perfect balance of nutrients that can feed a tree slowly over time. When mixed with the existing soil, around the tree, it helps to keep soil loose and energized. Aged manure is teeming with life, and much like compost, when incorporated into the soil, it creates a super-soil for trees to flourish. A few five gallon buckets of either, or a mixture of both mixed into the soil when planting is more than enough to do the trick. When planting, place 6 inches of the loose soil mix back into the bottom of the hole. This will provide a loose mix for the root ball to nestle on and expand in. It also ensures that the crown of the tree will be slightly above the soil line when planting. Finish by adding the rest of the mix to fill in and around the tree. Once planted, a thick 3 to 4″ coating of mulch will help to keep the plant protected. Mulch not only helps to conserve water, it also helps prevent competing weeds at bay. Perhaps best of all, it helps keep the soil temperature regulated, and provides valuable insulation throughout winter. Water bags are a great way to provide water to trees on a slow-release basis. Just because the weather is cooler in the fall, it doesn’t mean your trees won’t need watering. The single biggest reason trees fail in their first year is improper watering. That can be because of not enough water, or too much. That means watering with about 5 gallons of water every 2 to 3 days. Especially if mother nature isn’t helping provide any. This excludes of course wintertime when the tree is dormant. Watering more than this can actually be detrimental to the trees health and growth. Roots can become water-logged, and fail to take in needed nutrients. After a full year, the roots of the tree should be fully established. At that point, watering is only needed if mother nature fails to provide rain for weeks at a time, or in times of extreme heat. This Is My Garden is a gardening website created by gardeners, for gardeners! We publish two garden articles every week, 52 weeks a year. Sign up below to follow along, and follow us on Facebook @ TIMG as well. You can also share your backyard gardening tips or stories with us at info@thisismygarden.com to be our next feature! This article may contain affiliate links. Using Cold Frames – How To Extend Your Growing Season! How To Make Homemade Maple Syrup – From Start to Finish!